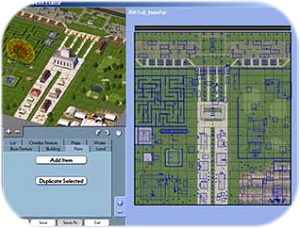 The Lot Editor is a tool that gives you access to much of the visual content in SimCity 4 (Deluxe Edition or with the Rush Hour addon) and enables you to customize the look of existing lots and use them in the game. This tool also allows you to create unique lots that can be plopped in your cities. Lots are generally what SimCity 4 uses to get buildings and props into your city. A typical lot includes a building, props, base texture and overlay texture. They are assembled in unique ways resulting in the many residential yards and other various plots of land that are seen when you zone and grow an area. Lots can also be plopped in your city in SimCity 4, for example the Police Station, Schools, Parks, Etc. Since lots are the component that provides the base for so much of the visual content used in SimCity, the ability to customize them provides a great deal of power in personalizing the look of your city. Here is a Lot Editor tutorial that also includes the basics of the PIM. This page was last modified on 15 July 2009, at 09:37.